Al Wasl Plaza ... Cimolai Rimond to provide steel work. A UAE-Italian joint venture, Cimolai Rimond says its steel work will provide the trellis structure for the 67.5-m-tall, 130-m-wide dome that will become an inspiring piece of architecture at the heart of Expo village. 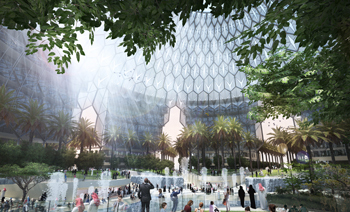 Al Wasl Plaza will be the central space of the 4.38-sq-km Expo site and will make a dramatic impression on the millions of people visiting Expo 2020 Dubai from around the world, says the company. The dome will incorporate a huge immersive projection experience that can also be viewed from the sky above, it adds. The steel work will provide the trellis structure for the 67.5-m-tall, 130-m-wide dome. Ahmed Al Khatib, vice-president of real estate and delivery at Expo 2020 Dubai, says: “Al Wasl Plaza will be an iconic central point of Expo 2020 Dubai. We are glad to be working with Cimolai Rimond Middle East, which has a strong track record, including working on the UAE National Pavilion at the 2015 World Expo in Milan. “This is the latest construction contract to be awarded this year (2017). Work on Expo 2020 is well on track and we are making great progress. We will be awarding the final construction contract for Al Wasl Plaza in the first quarter of 2018. “The size of the structure is huge – easily big enough to accommodate an Emirates airline A380 aircraft, with a surface area the same as almost five football pitches. It’s going to be an incredible sight at the heart of Expo 2020 Dubai, and a major attraction for District 2020 – our legacy development,” he adds. Al Khatib says construction across the Expo 2020 site was advancing well. Building work on Al Wasl Plaza will begin in early 2018. To date, more than nine million work hours have been completed on the Expo 2020 site, with 6,100 cu m of concrete being laid per week, and 59 km of pipes already laid as part of site infrastructure works. UAE-based companies are playing a leading role in the construction effort, including Al Futtaim Carillion, Khansaheb, Besix, Arabtec and Tristar Engineering, as well as early works completed by Al Naboodah Construction. In November, Expo organisers revealed images showing the Theme District buildings emerging above ground level, and more than 8,000 people are now at work across the site. Cimolai Rimond Middle East leverages a strong, decades-old Italian heritage with proven expertise across the complete architectural, engineering and construction eco-system. Together the joint venture partners, operating from its regional base in Abu Dhabi’s ‘City of Lights’, offer complete 360-degree turnkey construction, based on the latest advances in building information modelling (BIM) and integrated project delivery solutions.